Long overlooked, Dinah could be a great alternative to some of today’s favorites. 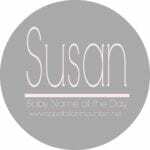 Our Baby Name of the Day was inspired by this post on 1895 baby names. Thanks to Nessa for making the original suggestion! The Book of Genesis tells us that Dinah, daughter of Jacob and Leah, was raped by a prince of Shechem. Dinah’s brothers retaliated with force. Anita Diamant’s 1997 bestseller The Red Tent imagines an intelligent, capable figure and a very different interpretation. In her story, the couple is in love, and wishes to marry. The name comes from a Hebrew word meaning judged, or perhaps vindicated. Like many a Biblical name, more girls were christened Dinah following the Protestant Reformation. By the nineteenth century in the US, it became a generic term to refer to all enslaved women. Sojourner Truth used it in an 1850 speech. The New York Times referred to freed slaves by the name in an 1865 article. The song “I’ve Been Working on the Railroad” dates to the 1890s, complete with pleas for Dinah to blow her horn. However, some lyrics are even older, dating to the 1830s. The name seems to be a generic term for an African American woman, at least in the earliest versions of the song. Fast forward to 1923, though, and the name’s image had changed. The Broadway musical Kid Boots – and the movie version it inspired – struck gold with the song “Dinah,” a jazz standard that you’d probably recognize today. Louis Armstrong, Cab Calloway, and Dean Martin were among the many to cover the tune. The Philadelphia Story started on Broadway in 1939, and became a big screen hit starring Katharine Hepburn in 1940. And so I assumed that the name became fashionable in the 1920s. Instead, the name appears on the edge of the US Top 1000 in the nineteenth century, then disappears until 1941. 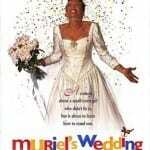 The blockbuster film put the name back in circulation. In 1939, a mere 35 newborn girls were given the name. By 1942, that figure more than quadrupled, to 142. More than the movie boosted this name. A younger singer, born Frances Shore, performed the jazz standard “Dinah” during an early radio appearance. It stuck, and by 1939, she was appearing on national radio under her stage name. Shore became a successful singer, and went on to host two television shows, the first in the 1950s, and another in the 1970s. But by the 1960s, the name was fading again, leaving the US Top 1000 after 1966. Rock and Roll Hall of Famer and celebrated 1950s singer Dinah Washington – born Ruth. George Eliot gave the name to a character in 1859’s Adam Bede. DC comics gave this name to early super heroine Black Canary, who debuted in 1947. A short-lived 1970s fashion doll was called Dinah-Mite. It’s also the name of Alice in Wonderland’s cat, and it’s been heard on CBS soap opera Guiding Light. Dina – hold the ‘h’ – is more likely to sound like Deena. Today the name remains rare – almost shockingly so. A mere 60 girls were given the name in 2015. This could make for the perfect fits-in/stands-out choice. Far less common than Nora or Clara, this one combines a vintage vibe with a certain spark. Do you think this name can make a comeback? This post was originally published on January 2, 2009. It was substantially revised and re-posted on July 11, 2016. I have a Dinah, born in 2006! We’ve yet to meet another one. Her older sister is Dale. I didn’t want any names in the top 500 most popular, so they are the only kids in their school with those names. I’m a Dina, hold the h, please, and love both Dina (deenah) and Dinah! I love this name. I wonder what will happen with the reboot of Electra Woman & Dyna Girl, though. (http://www.imdb.com/title/tt4644822/). I think the 70s ruined this name for a while (Dyna Girl and Dyn-o-mite! ), but it’s time for a comeback. I didn’t know there was a reboot! Thanks for the tip. Just joining in with the general surprise at how underused Dinah is! I’m from the UK and it’s really, really rare here, too, despite the slave connection not being an issue. I have no idea why! I guess it’s just one of those overlooked names which is there on everyone’s radar but no one thinks to use. I love it – it feels strong, feminine and timeless, and the connection to Alice’s cat is sweet as it’s one of my favourite books. I’d definitely name a daughter Dinah. I named my daughter Dinah in1997. The goal was a name that was strong and rare but recognizable. I guess the goal was achieved. I named my kitten dinah because my fiancé hates it for a child based on the story in the bible. That’s ok I got a dinah and didn’t make the Alice in wonderland connection until after it was made. I think Dinah’s a very good name, and underused too. I think of Dinah Shore when I hear it, and yes, the song… the slavery image not so much. But I don’t think today’s children will have any of these associations. I know if I asked my 14-year-old about the song, he would have no idea what I was talking about and he’s probably never heard of the name. 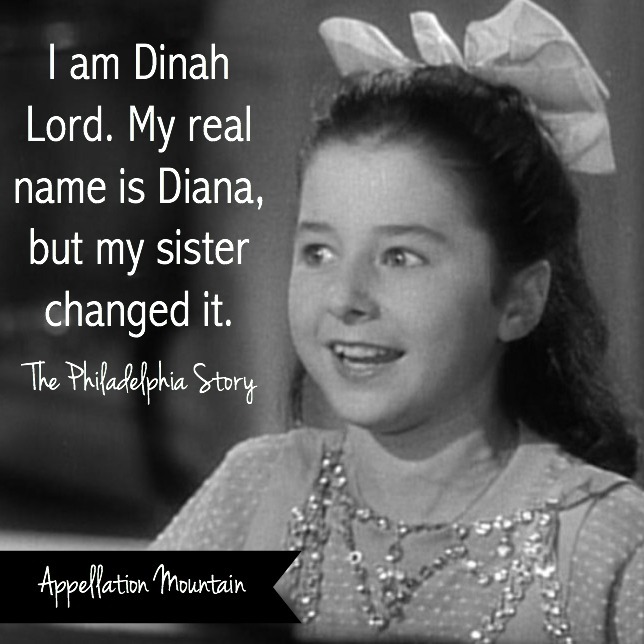 The Dinah in the Bible – don’t know if her name would be pronounced to rhyme with China or like Deena. It’s used in Israel and often written as Dina. I think usage of Dina or Deena in the US is actually not related to Dinah.. it’s sort of a nickname name (like Tina) that became an independent name. Oh, and I forgot to say – any association with Philadelphia Story or Katharine Hepburn is always a big plus in my book! I absolutely adore Dinah! It’s a great name! For me, the most strong association is the song (I sing it to my daughter quite a bit). When I was looking at Lily name, Delilah briefly came up, and there’s something similar there, but Dinah is way better. (Plus I’d rather someone sing Dinah won’t you blow than Why why why Delilah anyway). 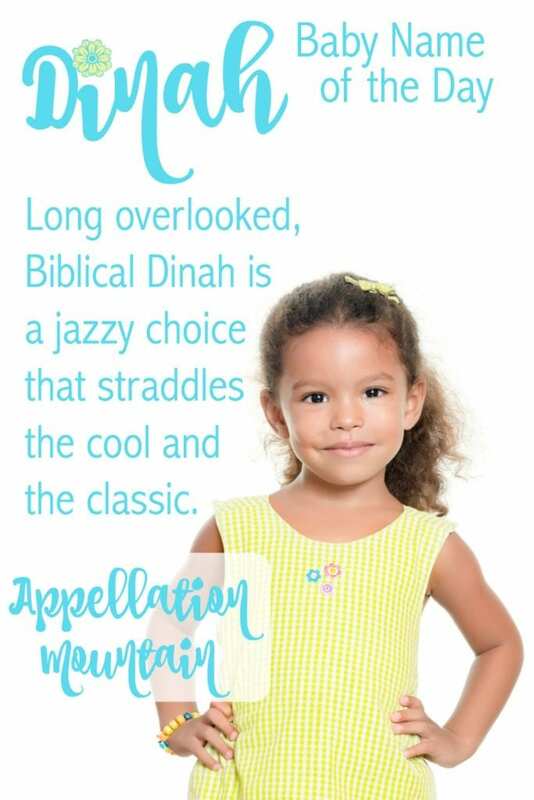 Dinah’s sassy and sweet and an altogether great name! I first came across Dinah in Enid Blyton’s ‘The adventure series’, the characters were Philip, Jack, Dinah and Lucy-ann as I recall and I was as charmed by her then (aged 10ish) as I am now! She reminds me of Eliza or Nora and Clara as Verity has mentioned. I love how she sounds old-fashioned but is totally wearable and I also love how she is short but doesn’t for one minute sound unfinished as so many short names can. Lola, sounds like a plan to me, let’s do it! I can see having a problem with the “I’ve Been Working on the Railroad” song, it hadn’t occured to me, but “Dinah won’t you blow, Dinah won’t you blow my horn” could be unfortunate in junior high. However, I doubt that many kids born now will even know that song, or at least it won’t be common enough that they’ll think of singing it to a little Dinah… I could be totally off base there though, I don’t know. I really like Diana, and Dinah is charming, and I’m a little surprised at her ratings. I think Alice’s cat is what introduced me to the name, I remember watching the Alice in Wonderland TV show and loving the name Dinah. I’m so surprised at the rankings! How is it possible something so recognizable could be so unused? That’s fascinating. It’s a shame about the house slave thing, but I could get over that. I’m really surprised it’s not more common, you’d think some of the “Diana” parents would use Dinah, they do sound quite similar, but to me Dinah is so much sweeter. All in all I just love her, I’d absolutely love to meet one, but now I realize how unlikely that is! I’d certainly use her myself, and I think you’ve bumped her up a couple spaces on my list!